Weather: It was very wet and overcast to begin with. Rain broke out a few times then like a breath of fresh air the sun broke through and it became a very beautiful day with that long sort of light that bathes everything in gold late in the afternoon. We finished off the cleaning & sorting of bulbs and carefully put them on shelves in the nursery. I witnessed the smallest tulip bulbs I have ever seen - they were pink and were like tic tacs. Then we carried on with some meadow work. 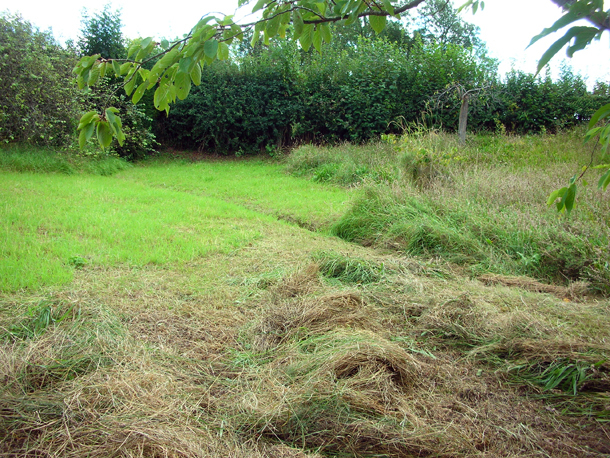 The cut grass was heavy from having been out in the rain. 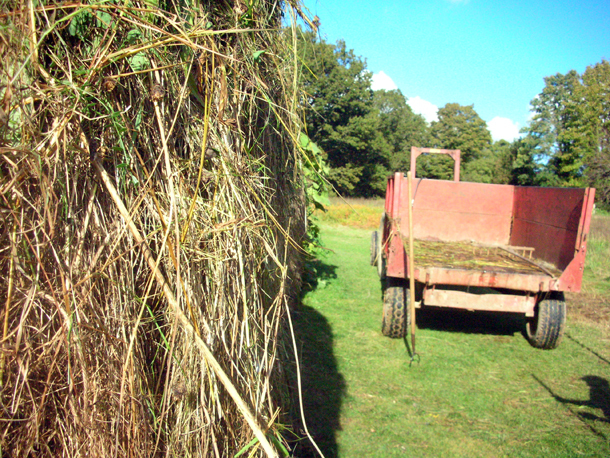 We then strewed more rich cuttings down at The Farm area where we are trying to cultivate more meadowland. In order to be able to keep building the mound higher and higher, not only do we need to build the corners up well, keeping the sides as a straight as possible is important. The last two days the weather has been practically the same, very changeable, stormy, windy, wet & rainy. 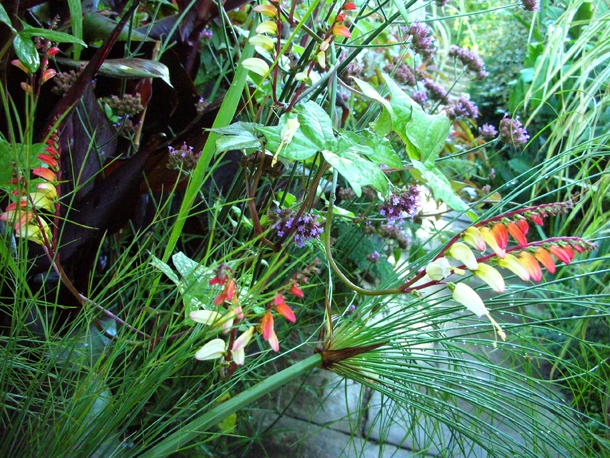 In the Exotic Garden I can easily pretend that it is a tropical storm and carry on denying the coming of autumn & winter. Holding on to the illusion of warmth and summer for as long as possible. Even the birds around me seem to chirp loudly in defiance. My work has mainly been a matter of seeing what wreckage has been done and to go round fixing and staking everything as much as possible. 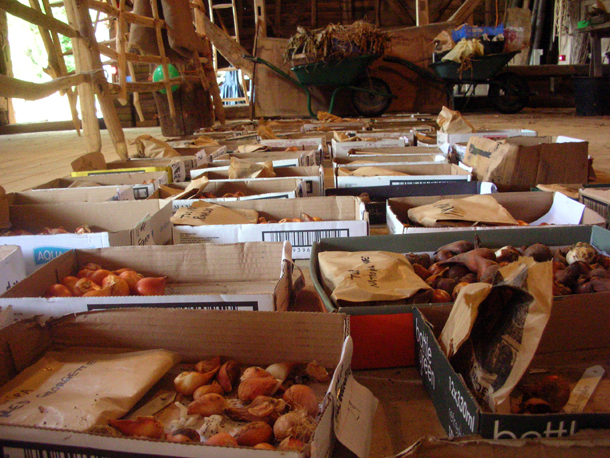 A job that has brought us some relief from the rain has been the cleaning and sorting of bulbs in the Great Barn - tulips, narcissi, crocuses, muscari & hyacinths. 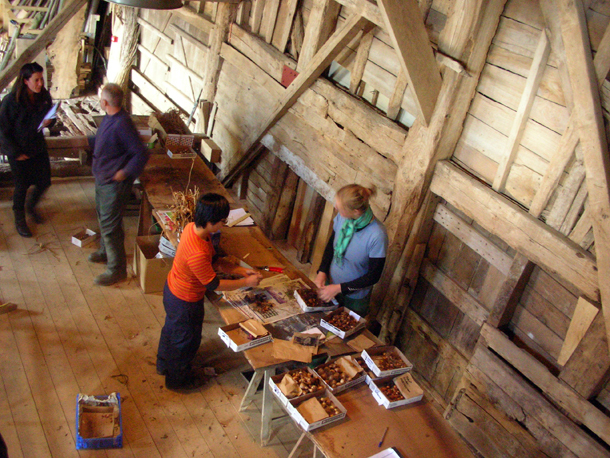 We count the flowering bulbs (ones that are big enough for flowering) and then put the rest in a paper bag bag as extras. In the early days of Dixters Exotic Garden Fergus & Christopher Lloyd started & sampled with just a small selection of plants. 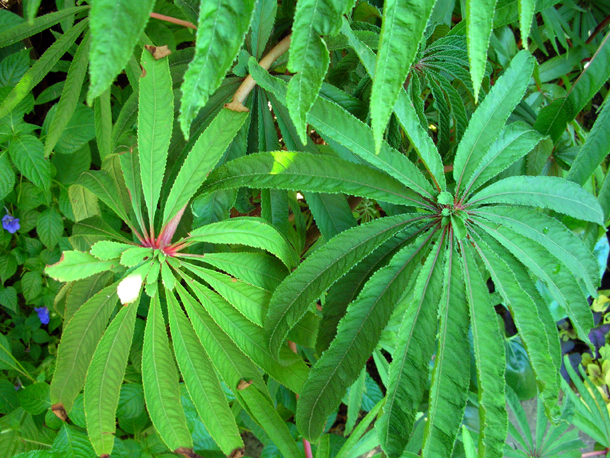 A lot of them were raised by themselves from seeds or cuttings. As the garden progressed they would try more plants & different ways of planting, even now the bedding are experimented with every year. This year it has become a taller & shadier lush jungle. 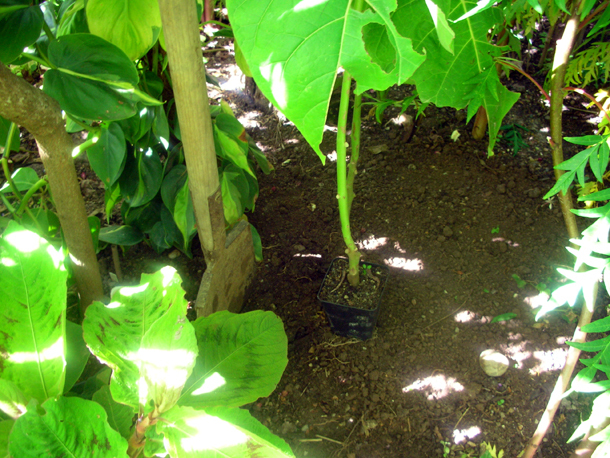 The banana trees - Musa basjoo & Musa ensete are the focal point of the planting, one bed is worked on at a time and then the next one would correspond with that. 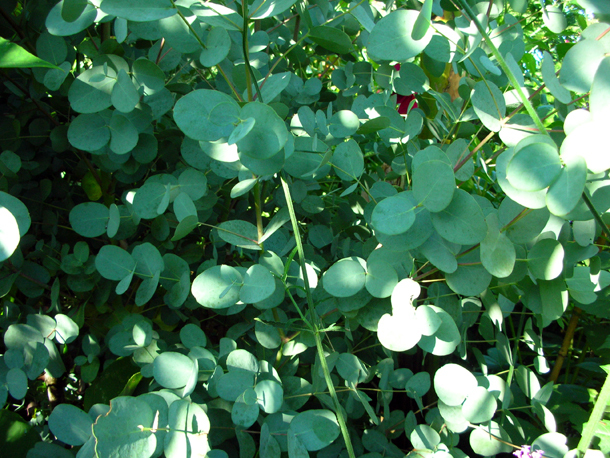 There are a small handful of permanent plants. 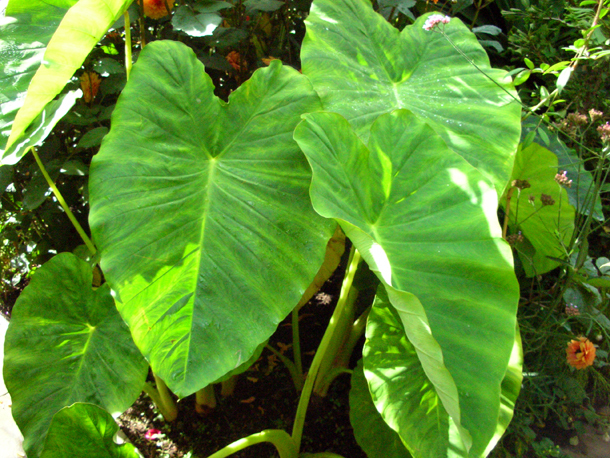 As they get bigger the planting morphs with them too. The hot & humid microclimate in this area created by the surrounding yew hedges & york stone paths allow for more tender plants to grow more successfully. It is also a frost trap, so as the threat of frost become more imminent we will at the ready for the mass exodus of lifting plants, protecting & putting them in storage. Contrasts & textures are what makes the garden - with alot of things grown mainly for their foliage, shapes and structure, if they flower then that is an extra bonus. 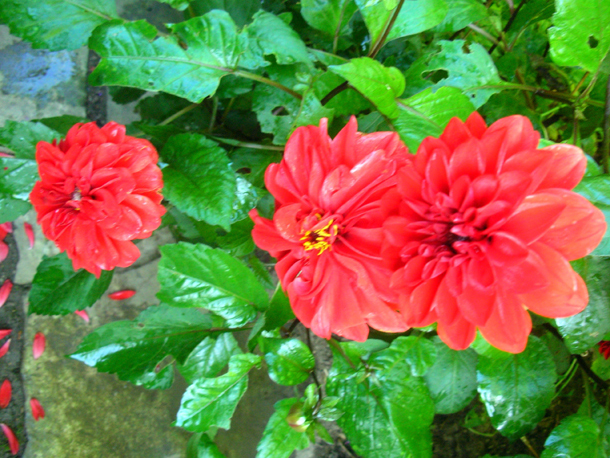 But flowers like Dahlias & Cannas are also used to provide splashes of colour. Hardy elements can be incorporated into this mix too. 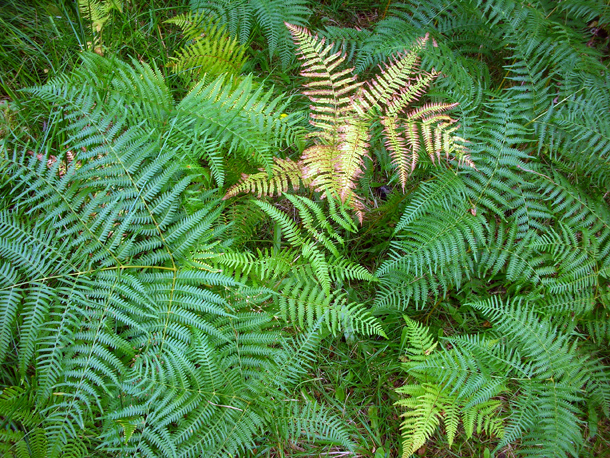 Plants are chosen if they have character and something to offer from late July to the early October. 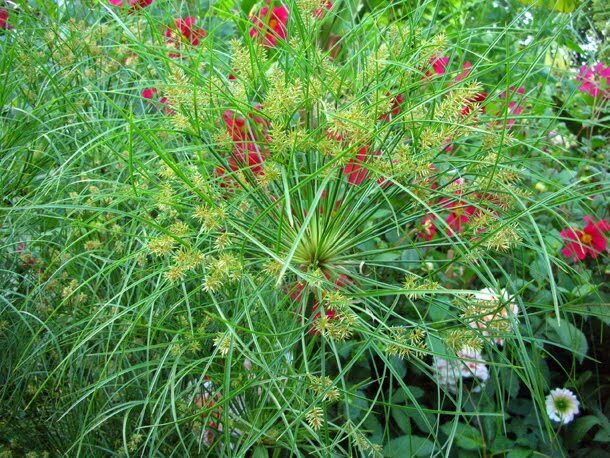 They retain a freshness & do not go brown like fennel or cardoons. C. Lloyd had written about doing such a garden in the 1970s and Fergus imagine it to be like walking into a Rousseau painting. The experience is to be three dimensional as opposed to the flatness that you can get in by just putting some bedding in a border. And to quote a line from Beth Chatto - 'to paint the sky' as well as the bottom. Weather: Strangely still in the morning like the calm before a storm, apparently we were in the eye of one. 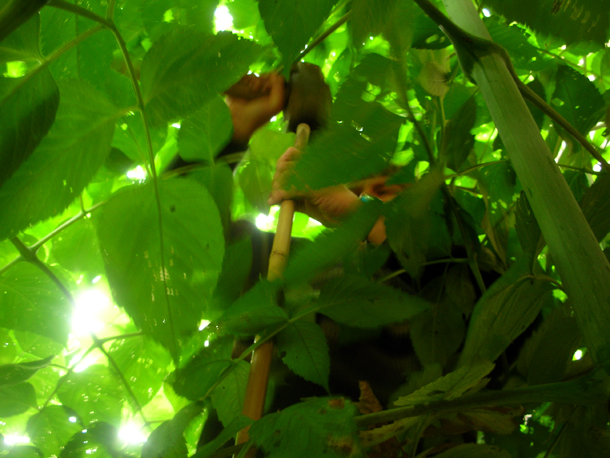 Then sporadic showers became more insistent wet sheets of rain with a strong wind that battered everything around a bit especially knocking off all the ripe mulberries off the tree. 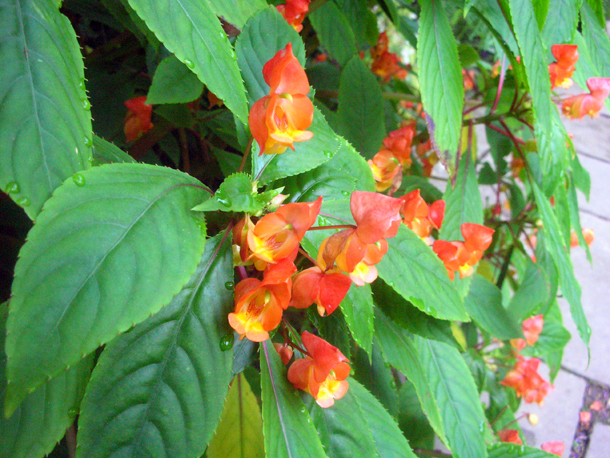 I had to clear out a lot of debris in the Exotic Garden and stake up a Impatiens balfourii that had been flattened into the path by the wind. 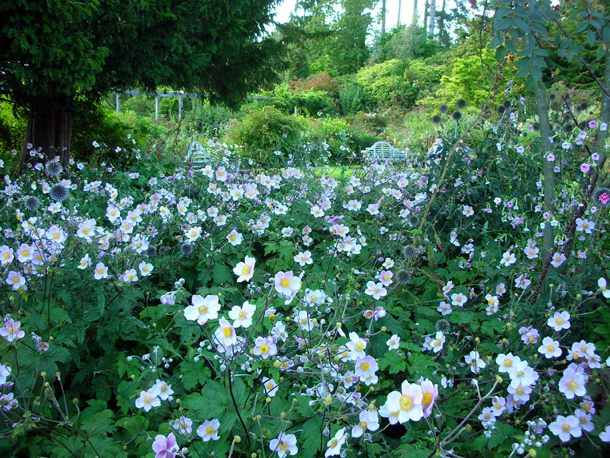 Then I joined the study day that Fergus was doing on this particular garden and how to go about creating your own exotic haven. More info about this soon. Weather: Cold in the morning, milder in the day. Slightly overcast. Friday 21st - today's order of the day was staking up some Dahlia trees - imperalis as the tail end of a storm is coming towards us on Monday. 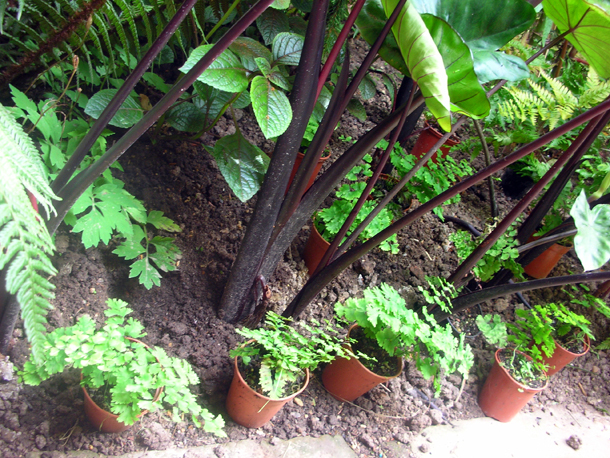 Then there was more planting in the Exotic Garden, I added some ferns to the base of a Colocasia fontanesii which has these long naked stems so it can be a bit sparse beneath their leaves, so we filled out the space underneath with some delicate Adiantum tenerum 'Farleyense' and Dryopteris erythrosora. They were great plants to work with it was easy to make them look like they had always been there or that they had sprouted up there themselves. 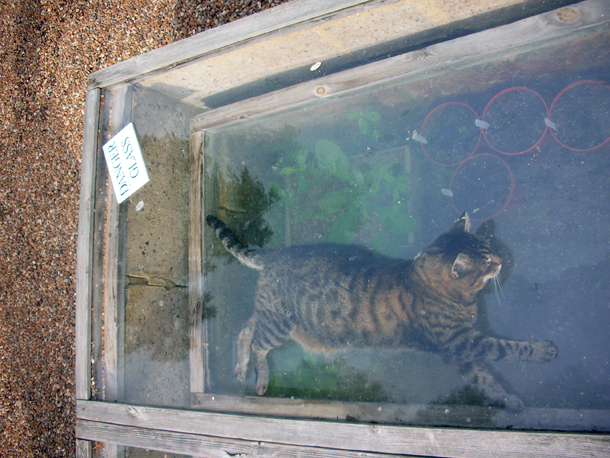 Titch the cat seems to have the right idea. The secret to how Ben reaches the peacocks and prunes them. About 10 years ago some of the peacock heads were mysteriously lopped off, Ben has done a pretty good job of regrowing them. Weather: Morning distinctly cold. Rest of day mild, sunny with the odd cloud (we're really lucky with the weather at the moment). 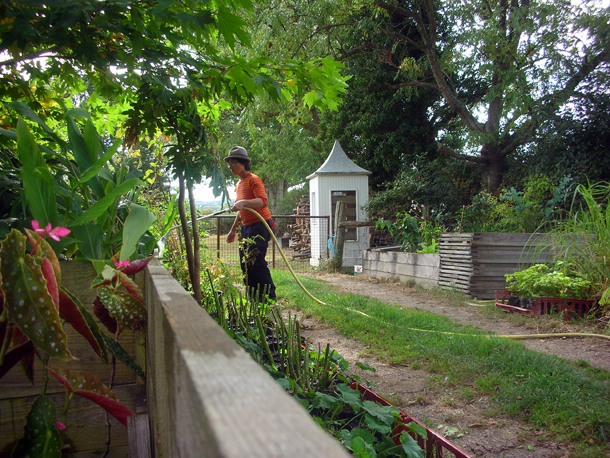 Today was a general clearing and maintenance day including watering and weeding the vegetable garden. Weather: Morning cold but clear. Sunny, cloudy and a bit breezy for the rest of the day. 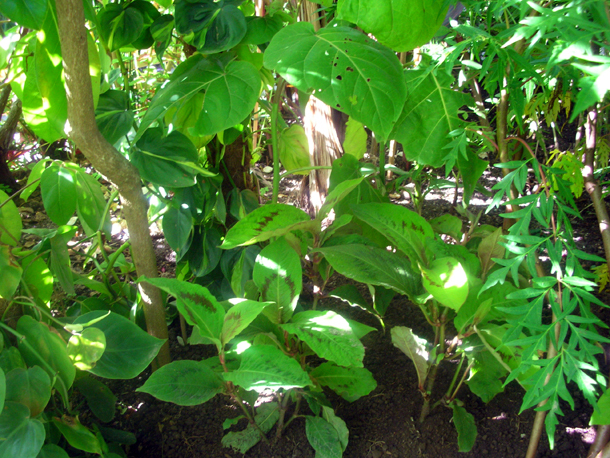 We did more planting in the Exotic Garden today. 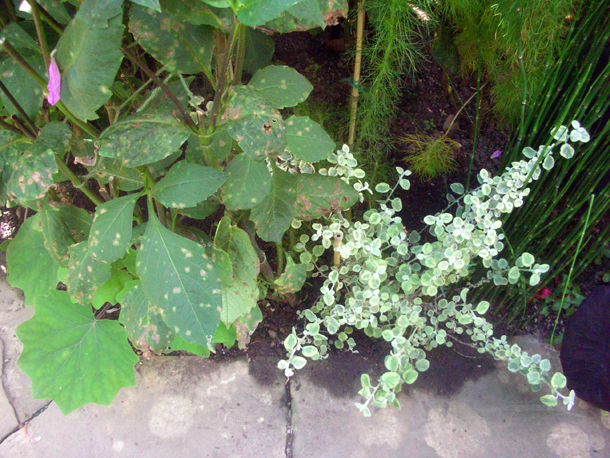 I put some Helichrysum petiolare 'variegata' (silvery plant on the right) next to the Senecio petasitis (far left) that I put in yesterday which has groovy furry leaves and bears yellow flowers. Fergus felt that more Persicaria virginiana were needed in the area that I was working on to help carry the the eye into the foliage even more which I agreed with. So I added to that. 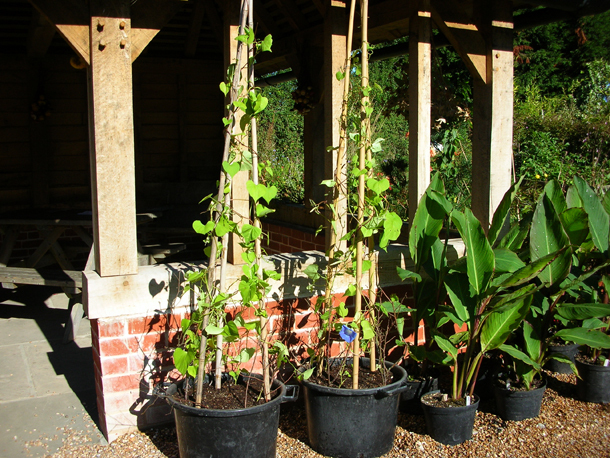 Although these plants won't stay in here very long the motto at Dixter is to plant it like we mean it to be permanent. Unfortunately the Dahlia leaves have been attacked alittle by a fungal disease so they're looking a bit sad. The piece de resistance today was when we filled a gap with this huge Yucca elephantipes on the left like it had always been there. 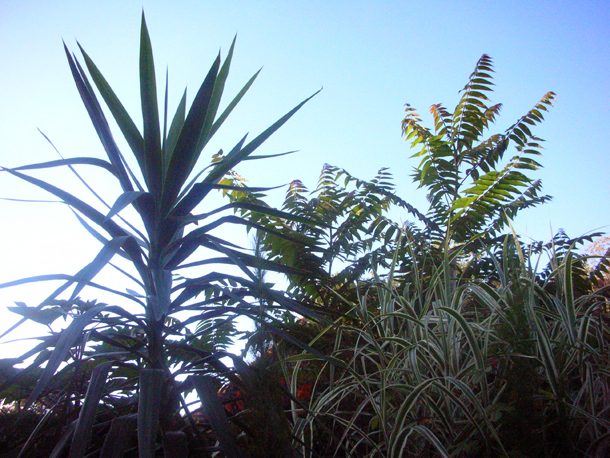 Towering above next to the Arundo donax & tree Dahlia imperalis. 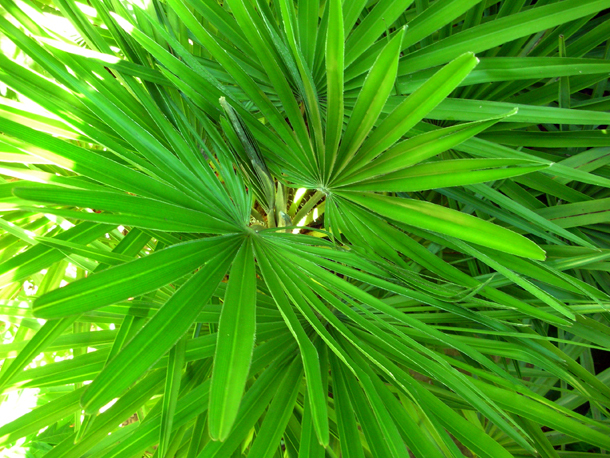 When we position plants we have to consider how it will grow - where it would grow out from, how big it would get etc. For it not to look bitty or incongruous to it's setting. Even at the point it actually goes into the soil there is potential it can change or be different. Once we were ready to plant we tentatively poked around the area with a spade to check if there were any bulbs or obstructions. When we were sure it was clear we dug a hole by 'chopping' the soil. If there is not enough width, then we go a bit deeper. We lined the hole with compost no. 2 that contains osmocote - which is a slow release fertiliser and mixed it in. Usually we would use an old soil mix but there wasn't much of that this time. We put the plant in, loosened up the roots a little to help it along. 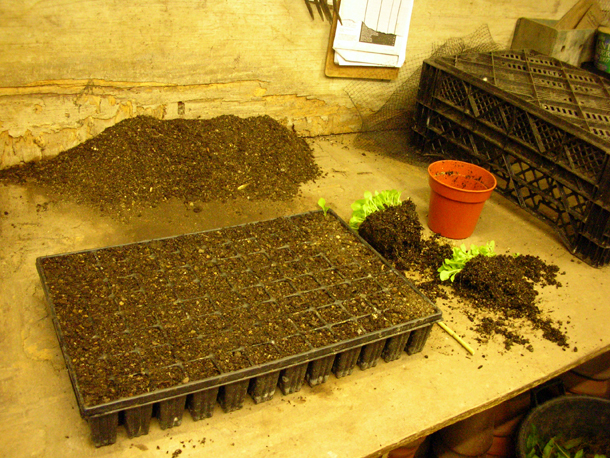 Then covered it back with soil whilst pressing it in and smoothing the surface over. 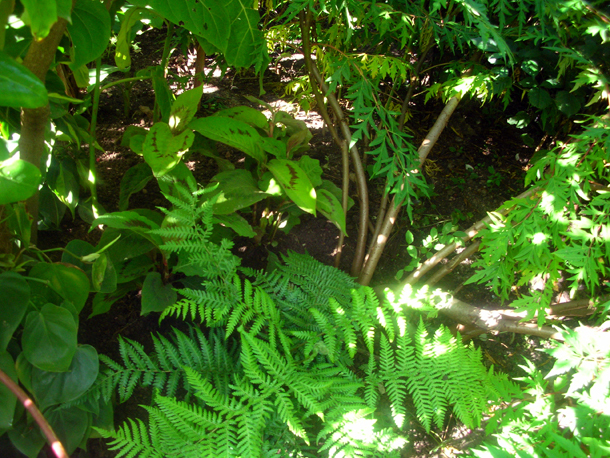 finished with a fern called Dicksonia antartica which goes together very well with the texture of the Rhus glabra laciniata (aka smooth Sumach). In the Exotic Garden some tired Verbena bonariensis & Chrysanthemum sangetum were taken out. 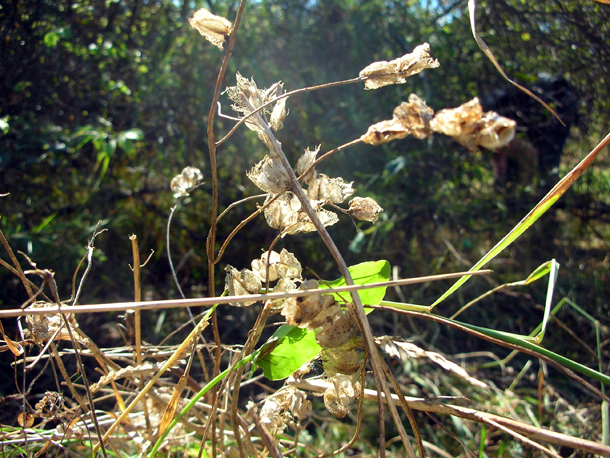 The latter we had collected seeds from the day before. Then we did some planting where there were any blatant gaps. We scouted the nursery for plants that we thought would be appropriate, laid out a selection, then it was a case of trial & error. Putting combinations together until we got something that we thought would work, placing them in the area of planting and making sure that it fitted in with everyone else. Then we would confirm with head gardener Fergus Garrett before we went ahead, who would make changes or give his consent. 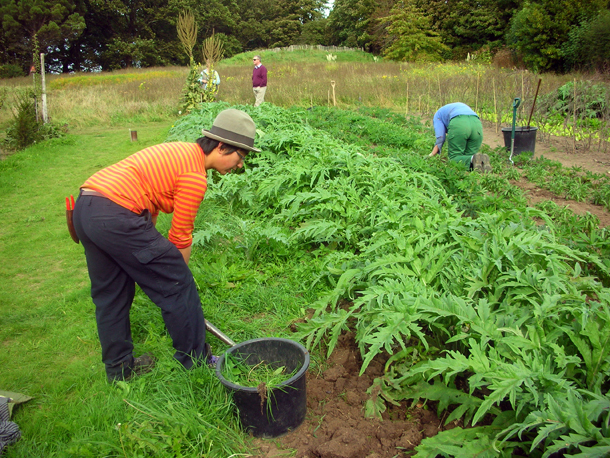 There were a lot of Dahlias in the Exotic Garden that needed staking today. As Emma who I worked with describe - it's like ballet - the lady in her tutu is about to do her jump and be caught by her partner and it is to catch them in time so that they don't end up legs flailing everywhere. Dixter has a very special way of staking, it's quite hard to describe but I shall do so briefly and try to illustrate it better at some point. Basically green twine is used, a clove hitch knot is made around the stake, in this case bamboo. One loops the string around the stem of what they want to hold up - always best underneath a node. But it is done in this way that the string is still adjustable if needing to be tightened. Then once the string has gone round securing the desired stem(s) the two ends are tied together in a special knot that allows it to be easily untied if further adjustments are necessary. Dahlia 'Grenadier' is one of the ones I have been working on today. 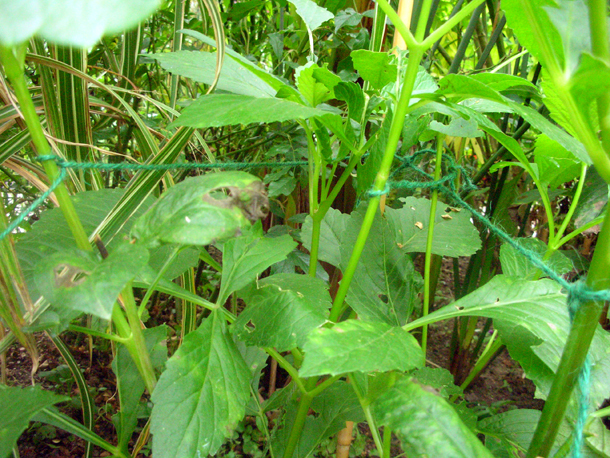 It is amazing how you can use it to manipulate a plant and that the string & cane can still remain almost invisible. 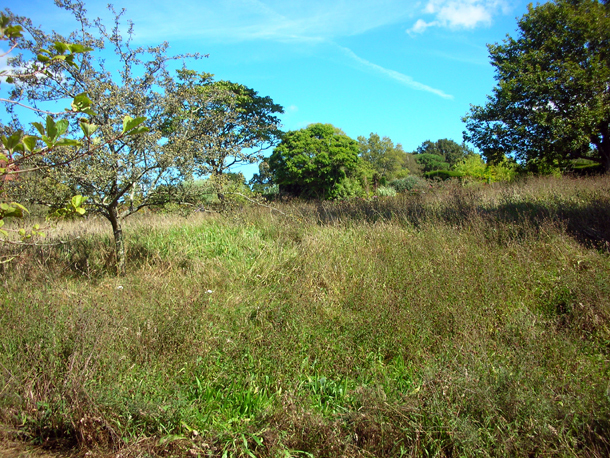 We moved onto cutting the meadow areas next to the big pond at the front of the house and it was interesting how different it was to the ones we have done so far. 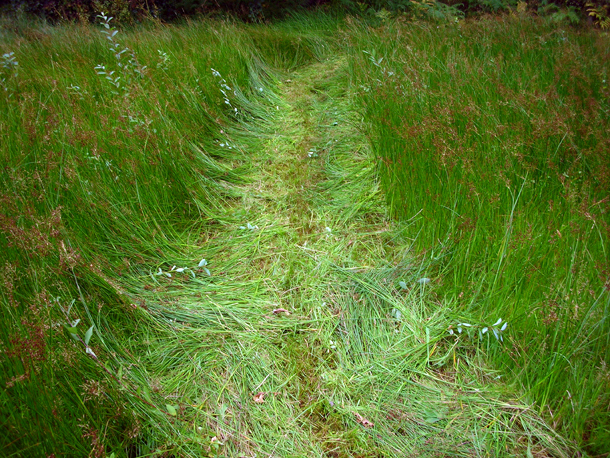 Here it was mainly Juncus - a very straight sedge grass and ribbons of dark lush greens. 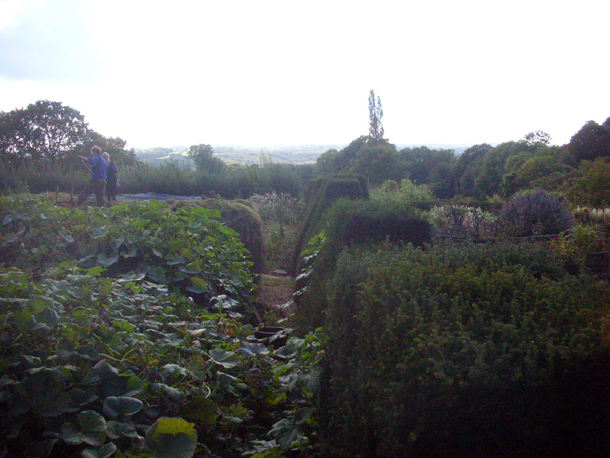 On Thursday I didn't do so much in the garden because I was lucky enough to join a visit to Gravetye Manor. 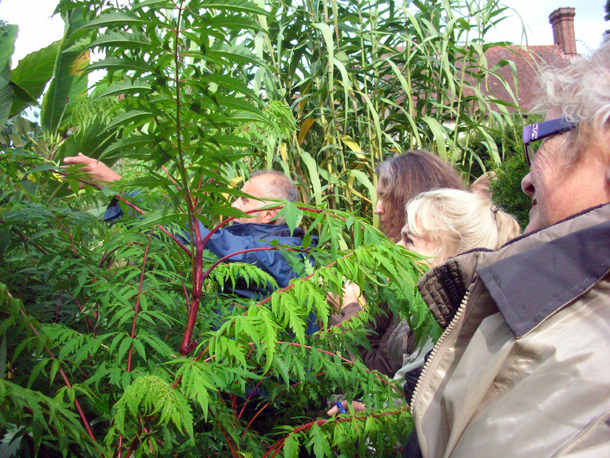 There has been a week long symposium at Dixter where gardeners can come and get exclusive gardening tuition. As part of it they go and visit other gardens of interest nearby and this was one of them. 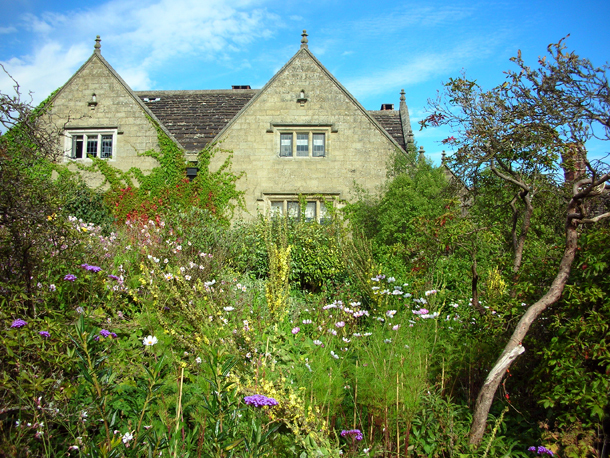 Gravetye is like a hidden secret - it is the garden of William Robinson who was a writer, gardener & botanist from 1838 - 1953 and was very influential in the history of British gardens. It is now a luxurious hotel & restaurant. 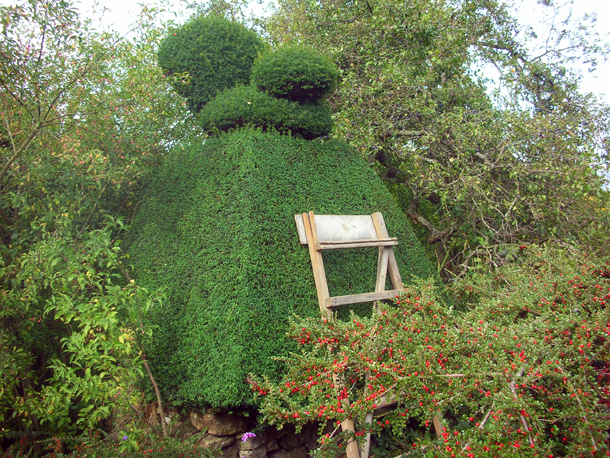 He inspired people to bring back 'nature' and naturalise wild flowers and plants into their gardens and he is renowned for his work 'The Wild Garden'. Interestingly enough Daisy Lloyd who started the gardens at Dixter was hugely inspired by his work & this book. 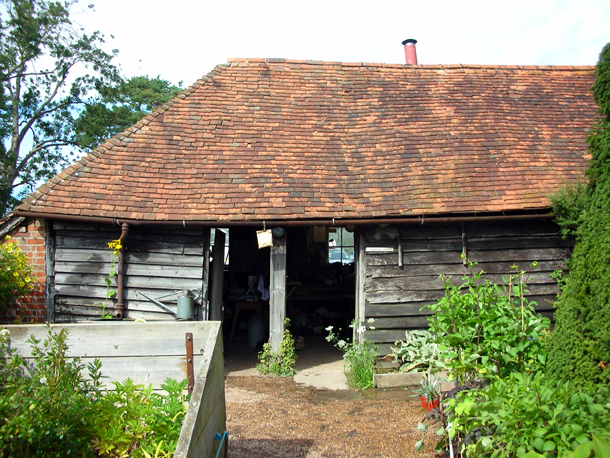 And Tom Coward who is now the talented head gardener of Gravetye used to work at Dixter. There was a stepping in time feel about the place - the manor building itself is from Elizabethan times, but it was as if the sceneries themselves were one of the beautiful prints lifted straight out of Robinson's book from the late 1800s. 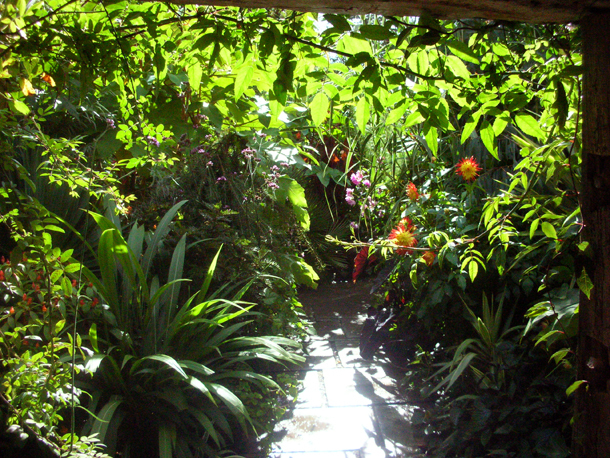 The garden also has an ingenious kitchen garden that drains frost & works like a greenhouse but outdoors, an old watercress bank, Victorian cold frames & greenhouses, a sister pond to Monet's water garden in Giverny and much more. Tom is sensitively restoring all aspects of the garden as it has seen a bit of neglect over the years, but it also has the dreamy opportunity for creativity and new innovations too. I was told that this was a spot that Christopher Lloyd would sit some days when the garden was open to the public, a spot where he wouldn't be seen (when it was uncut of course). I am couple of a days delayed with my posts because I have had problems with the internet. Weather: A distinct chill in the air in the morning - autumn is coming. A bit breezy. Hot in the sun, cool in the shadows. 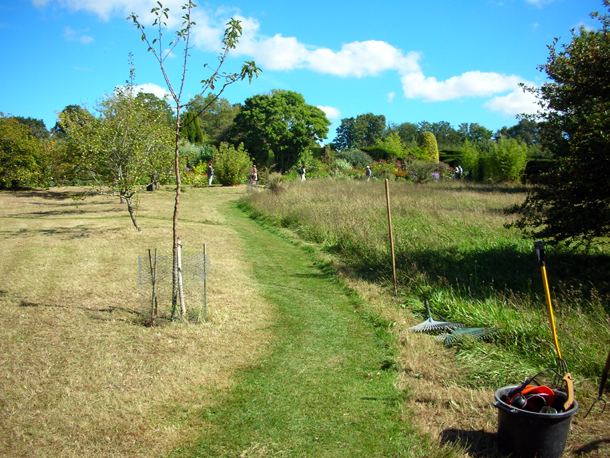 We have nearly finished cutting down all of the meadows in front of the Long Border. 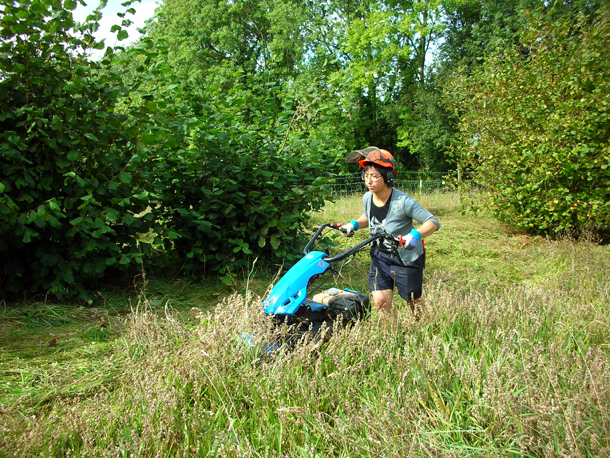 In the background is the close cutting mower we run across the cut meadow to cut the grass down even more. 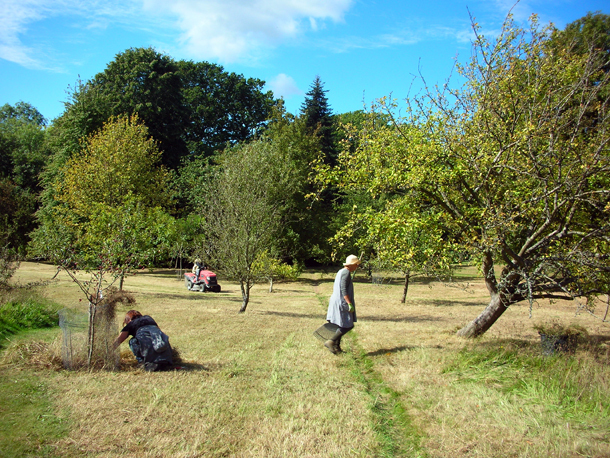 We also have to strim and manually pull out & cut down the tricky bits around the trees. Not so much to report home about today except that one has to be careful when doing the same task everyday that one doesn't lose touch of why one is doing it. For example to not overdo the deadheading in the exotic garden, to keep stepping back, looking & remembering what we are trying to achieve. 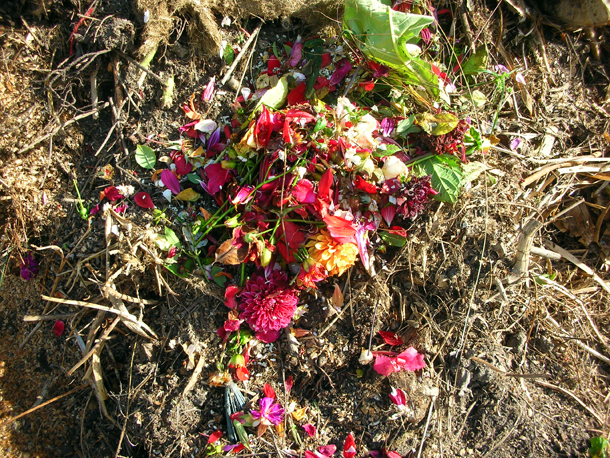 Sometimes a Dahlia or a Rosa is just about to die back but still has vibrancy & colour and still offers something to the aesthetics of it all so it is best to leave them. The discretion of this can get a bit blurry but thoughtful consideration has to be at least maintained each time. 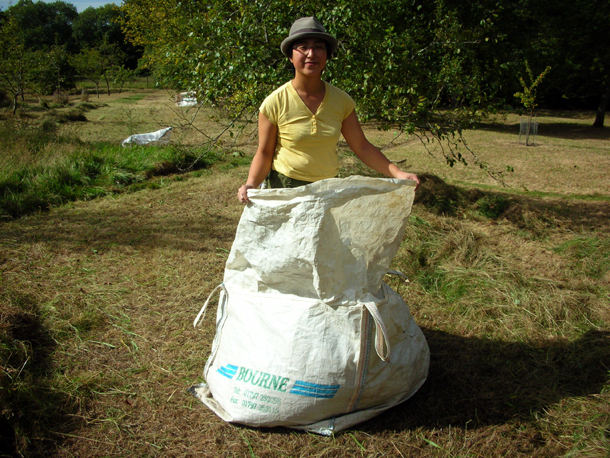 Some of the cut grass from the meadow cuttings this time were bagged up in big ton bags, as we are selling them to someone who wants to use them as strewings to create/ enhance their own meadow area, so we made sure to only put the diversely rich stuff in. 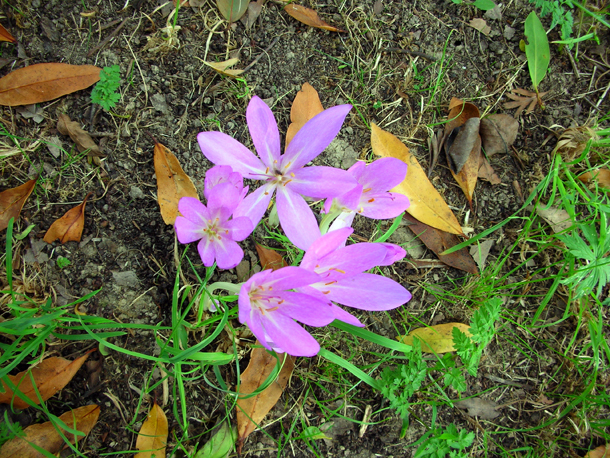 Colchicum autumnales are starting to appear in the meadows at the front of the house. For the rest of the day it was my half day for catching up with things, my plant ident & starting my first project which is looking at planting in cracks. More info about these soon. 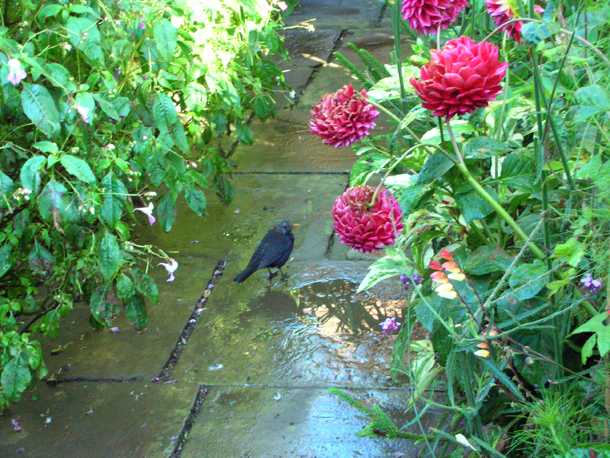 There is a wealth of wildlife in the gardens of Dixter, constantly I am surrounded by birds like blackbirds and ravens darting elusively into hedges and foliage. It is almost like a game that they play with you, popping out and then scuttering into their maze of undergrowth. 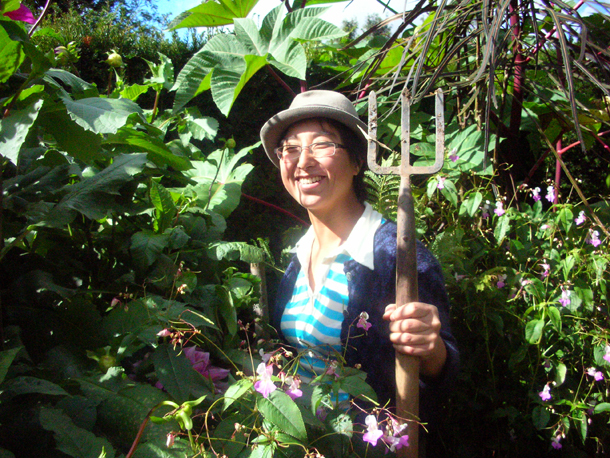 I was generally doing watering, clearing out pots of dead or unwanted plants. 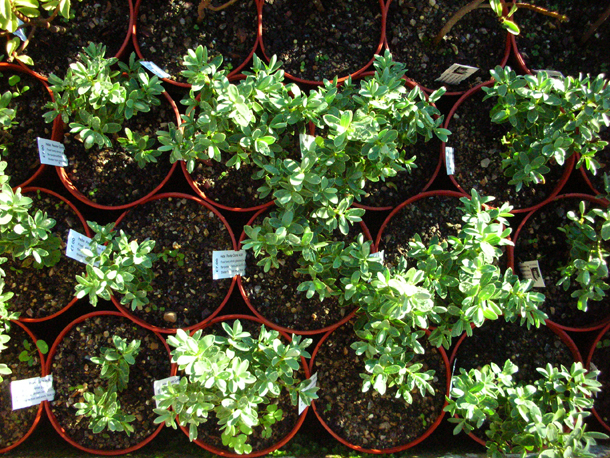 For plants that were a little pass their sell by date & needed planting out we made these into pot displays. 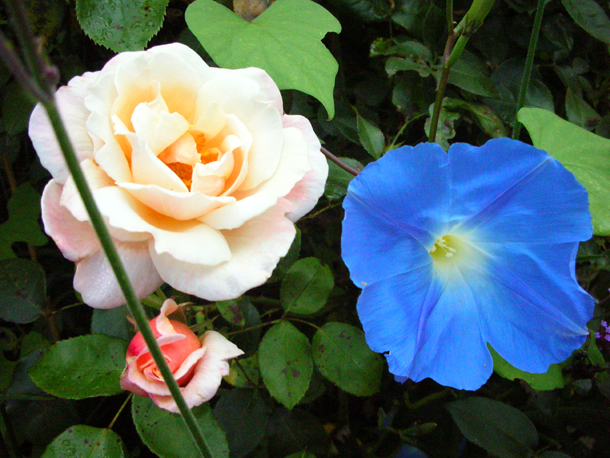 I did this for a load of Ipomoea 'Heavenly Blue'. 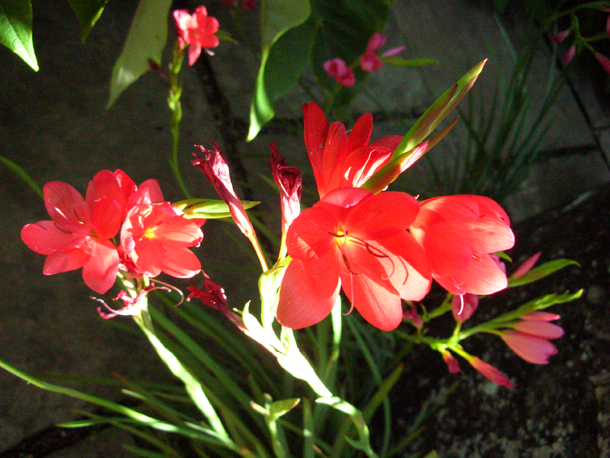 In a pot around 40cm wide and same again deep I filled with soil around two thirds of the way. Then I created a pyramid 2m high with three bamboo canes and placed the plants around them. 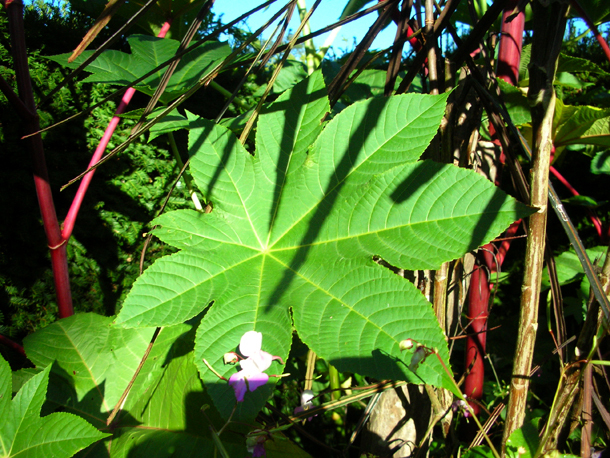 Then I would weave the Ipomoea through the three canes and tie it where necessary for support. Any yellowing/ dead leaves were removed. 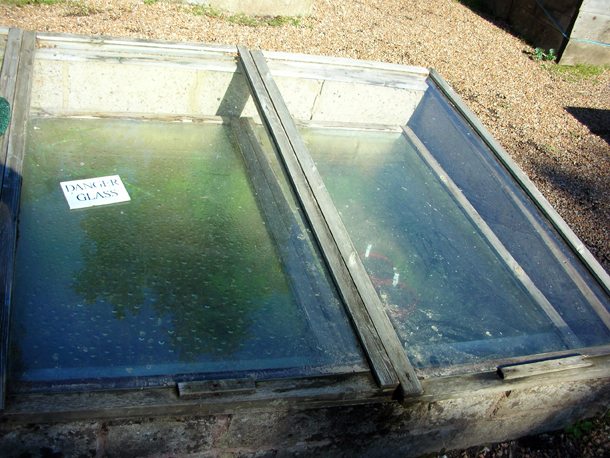 It was topped up with soil but not so that it was level with the top, as this is not conducive for watering and more likely to cause run off and the plant not being able to uptake water properly. We also put pea sticks (about 30cm tall) around them just at the base and snipped off the plant's tips so that it would branch out more. General rule to help the presentation of plants in pots to look better - to place them on the outskirt of the pot and work your way inwards. 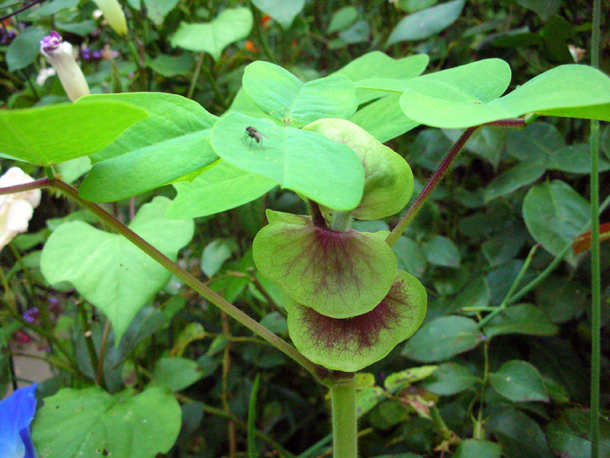 Below is an Ipomoea in bloom in the Exotic Garden next to Rosa Chanelle. I personally feel that the colour would go better with something like the orange of Dahlia 'David Howard'.